I can't wait to get my manicured hands on the next issue of Parlour Magazine featuring Edmonton designer, Bridget Smatlan. 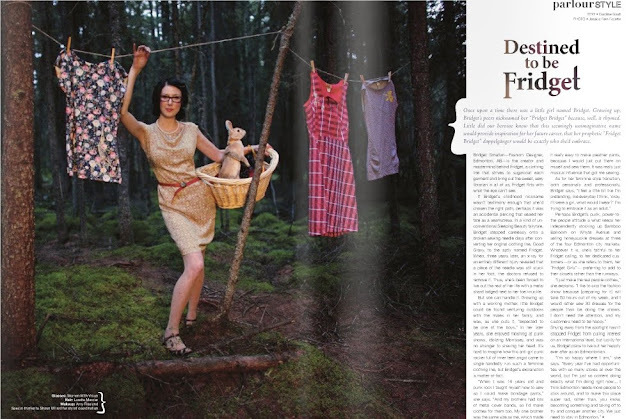 The photo shoot looks absolutely magical with bunnies, clothespins and a woodsy dreamland. Not to mention the fabulous Bridget modeling her Fridget creations. My only complaint is the measly ONE photo for the article. Check out Parlour's "Behind the Scenes" video of the photoshoot. And get a sneak peak of the entire next issue at Parlourlife.com. You can get Parlour magazine at Black & Bold 12220 Jasper Avenue.